Read on as the design minds at Jasmin Reese Interiors make the case for this month's featured color: orange. Orange is one of the boldest colors on the spectrum, calling your attention immediately (but there’s a reason it’s used on “Caution” signs!). Don’t let those fluorescent traffic cones give orange a bad rap — when used correctly, it can be an incredibly sophisticated way to add some unexpected zest and movement to your space. Many homeowners shy away from including orange in their interior design palate fearing that it will be too intense or distracting. In truth, it’s the intensity that makes orange such a fabulous accent color — the trick is just to use it sparingly! Here’s a Bohemian chic kitchen in Lake Forest that we had the pleasure of designing recently. 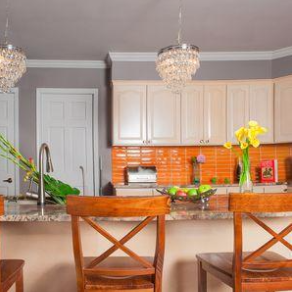 We used an orange tile backsplash to add some visual interest to an otherwise neutral-toned space. A few key orange accents around the room, using furniture and window treatments, pick up the orange from the backsplash and complete the look. Here’s another great example of a strong orange accent making all the difference. This orange nightstand subtly draws out the orange trim on the pillows. Orange took this sweet twin bedroom from conservative and classic to unexpectedly stylish. This orange doorway at the Parker, Palm Springs, shows us exactly what fierce modern style looks like. It’s all about contrast! 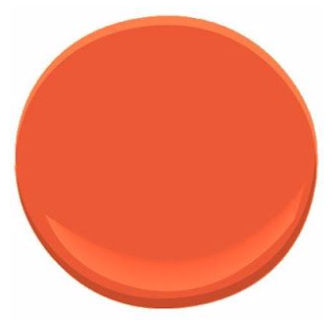 Our favorite orange paint picks are Orange Nectar from Benjamin Moore, and Navel from Sherwin Williams. Use either of these to add some pop to an accent wall or piece of furniture in your home. Sherwin Williams’s 2015 Color of the Year Coral Reef has been applied to paneled accent wall in this elegant sitting room. Notice that it doesn’t take anything away from all the gorgeous layers of white furniture, window treatments, or the striking fur rug — the whites pop brighter! Just because we’ve emphasized the importance of orange as an accent color does not mean it will necessarily overwhelm a space if it’s used as the primary color in the scheme. If you love orange, go wild and paint the entire room. The orange walls paired with sleek blue furniture, and blasts of pinks, yellows, and reds in the artwork give this fabulous dining room that appeared in Elle Decor a fun, energetic vibe. How are you daring to use orange to liven up your home or garden? Inspire us with pics! Need to find just the right orange? Call us for a free color consultation. Looking for professionals to do the painting for you? Call Blue Door Painting today.